Automatically comes in uppercase letters, but if you put lowercase letters there is a chance it could come that way. Spelling & punctuation will appear exactly as you entered it on your order. There is a 15 character limit for your name. The more characters there are, the smaller the personalizations. 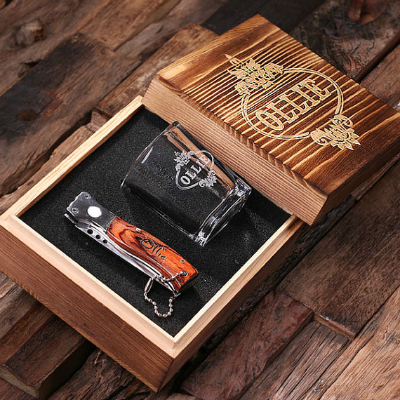 This stylish Personalized Pocket Knife and Shot Glass Gift Set comes in a personalized wooden box that includes a personalized shot glass and a quality personalized wood handled pocket knife with a balled chain. 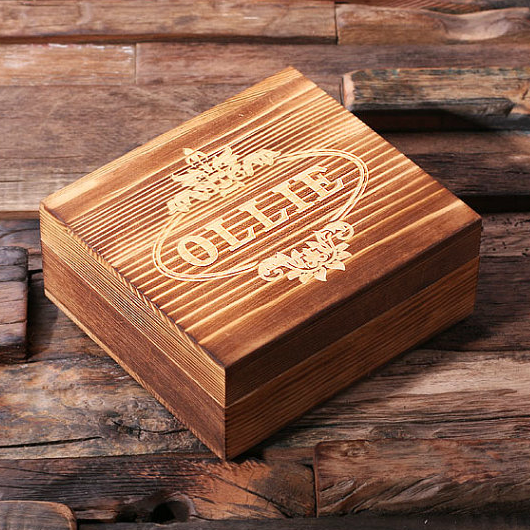 FREE PERSONALIZATION for all pieces. Add 7 to your cart and at checkout, use coupon: knfwh2018 to get one FREE. A $44.95 savings. Coupon can not be combined with another coupon and expires 12-31-18. If you want to order 14 or more, contact us for another discount. Perfect gift idea for a birthday, anniversary, holidays, Christmas, Valentines Day, Fathers Day or other special occassion. Perfect for husbands, boyfriends, brothers, fiances, a groom, best man, groomsmen, father of the bride, father of the groom and other men in a bridal party. 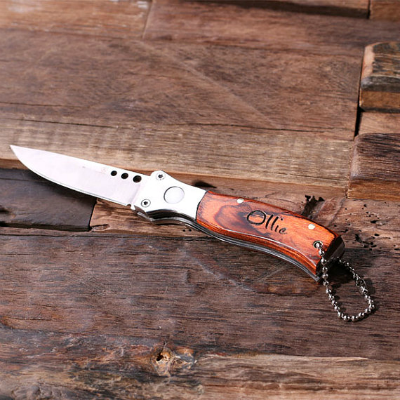 An excellent choice for groomsmen gifts. ♦ Size: Shot Glass is 2 oz.